Unprotected amide protons can undergo fast hydrogen exchange (HX) with protons from the solvent. Generally, NMR experiments using the out-and-back coherence transfer with amide proton detection are affected by fast HX and result in reduced signal intensity. When one of these experiments, 1H–15N HSQC, is used to measure the 15N transverse relaxation rate (R2), the measured R2 rate is convoluted with the HX rate (kHX) and has higher apparent R2 values. Since the 15N R2 measurement is important for analyzing protein backbone dynamics, the HX effect on the R2 measurement is investigated and described here by multi-exponential signal decay. We demonstrate these effects by performing 15N R 2 CPMG experiments on α-synuclein, an intrinsically disordered protein, in which the amide protons are exposed to solvent. We show that the HX effect on R 2 CPMG can be extracted by the derived equation. In conclusion, the HX effect may be pulse sequence specific and results from various sources including the J coupling evolution, the change of steady state water proton magnetization, and the D2O content in the sample. 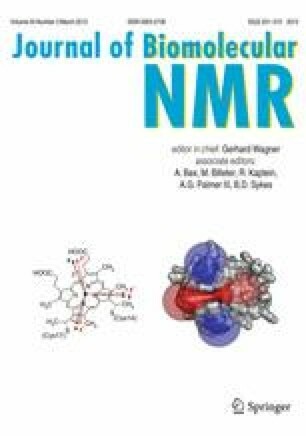 To avoid the HX effect on the analysis of relaxation data of unprotected amides, it is suggested that NMR experimental conditions insensitive to the HX should be considered or that intrinsic R 2 CPMG values be obtained by methods described herein. The online version of this article (doi: 10.1007/s10858-013-9706-1) contains supplementary material, which is available to authorized users. K-PW was supported by an NIH Interdisciplinary Research Workforce Fellowship (5R90DK071502). This work has been supported by NIH grants (GM087012 and GM45302) and NSF grants (DBI-0403062 and DBI-0320746) to JB.